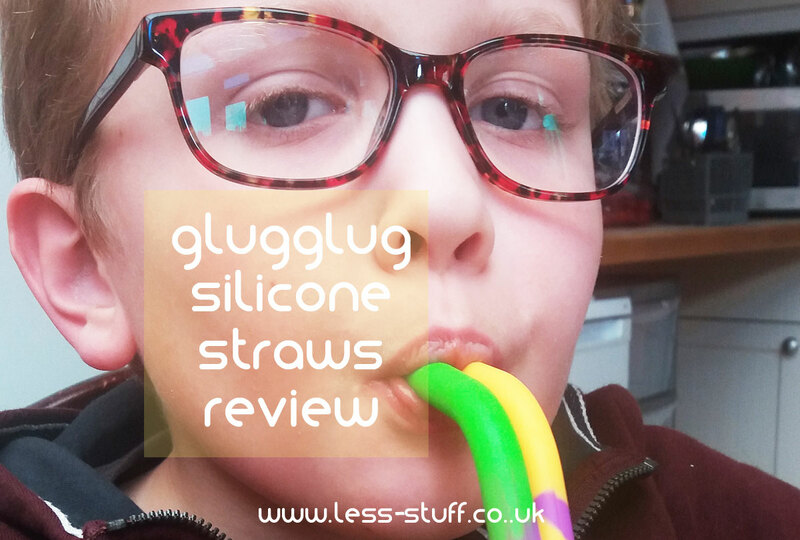 glugglugplanet sent me 2 packets of reusable silicone drinking straws to review. I shared them with my friend Jo and her son and we set about thoroughly road testing them. 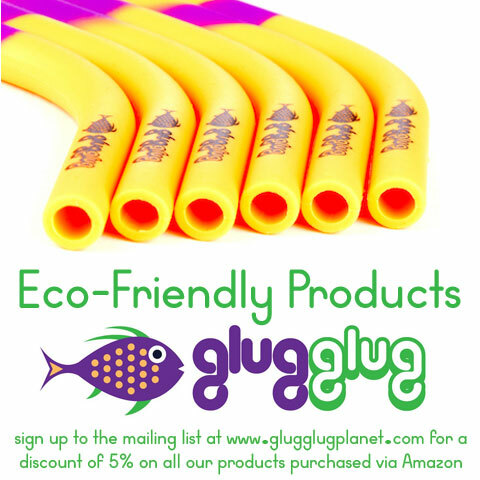 glugglug straws are washable, reusable silicone replacements for the polluting plastic straw. They come in two diameters that can be cut to length if you want them shorter. They are made of BPA free, food grade silicone and certified to be free of lead and Phthalates, whatever they are! The smaller straws are a tiny bit bigger than old style disposable straws and the chunky ones are good for smoothies. 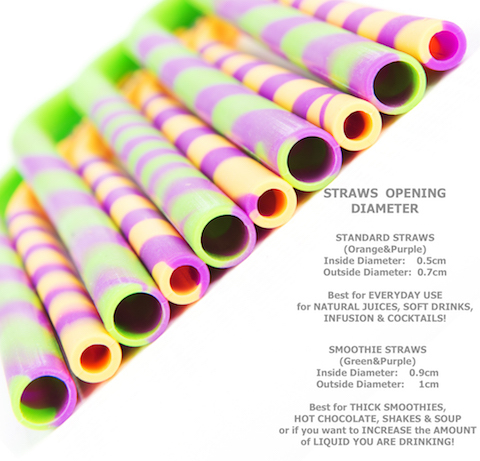 They come with a built in curve so if you are cutting them down you have a choice of curved or straight 10cm tall straws, the same length you find in disposable drinks cartons. The big ones are bright green with a purple candy stripe (Suffragette colours!) and the smaller ones are yellow with a purple candy stripe. glugglug straws are shipped in paper bags with a neat little string fastening. The bags are sturdy enough to reuse a lot of times. Each packet comes with a little brush to clean the insides of the straws. This is wire with plastic either end so it is not recyclable but one bit of plastic you will re-use again and again has to be better than throwing away hundreds of straws a year. There is nothing on the bottle brush that looks weak and I imagine it would last a very long time. I was worried that the straw would be really squishy and seal its self as I drank through it. I was wrong! The smaller straws are great, they feel nice in the mouth, taste of nothing but the drink and deliver my juice at the right speed. glugglug say that the straws are good for kids with sensory issues and for people with Parkinsons. There are no hard edges anywhere on the straws so it would be very difficult to hurt yourself on one. “The straws are brilliant. The dentist said it would be good for my son to use straws to stop his teeth getting more discoloured and I was fed up with buying the plastic ones so I got some paper ones which could be recycled but obviously still throwing them away and not all of the bin-men recognised them as non-plastic anyway. glugglug straws are sold by a a small, British-owned Ltd started in late 2015. They love nature & have created a series of eco-friendly products (and packaging) which are designed in the UK. glugglug products are aimed for people wishing to have a minor impact on the world by using goods for a long time without constantly replacing them. They strive to provide premium quality and exceptional customer service. They say they “look forward to serving you & to help nature to preserve its beauty”. If you sign up to their mailing list you will automatically get 5% off any orders via Amazon UK-IT-FR-DE-ES and USA.